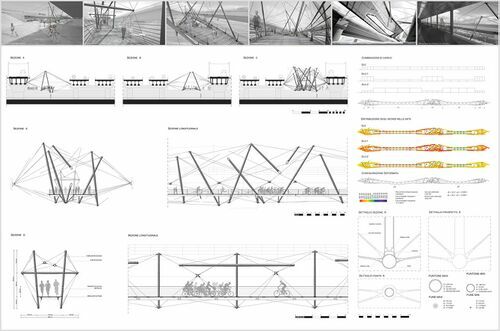 Read here about a bridge design, based on tensegrity, by Stefano Paradiso and Marco Mucedola. The "Suspended Tensegrity Bridge" is a design by Stefano Paradiso and Marco Mucedola that implements innovative methods and skills from structural engineering and architecture. The project concerns a footbridge over the Sesia river, not far from Greggio. The bridge will be part of a European program of facilities, known with the name of “veloroutes8” that is expected to connect Cadiz to Athens. This bicycle route would connect all European countries among each other. An alternative proposal of the Italian participation in the program was the creation of a beautiful path through the rice lands of the Pianura Padana. “Canale Cavour” is the name assigned to the historical landscape. “Canale Cavour” is a masterpiece of cultural heritage of these lands. It consists of an hydraulic net, 85 kms long whose construction was ended in 1846 by the newborn Italian kingdom. It is composed of 101 bridges, 210 “tombe- sifone” and 62 “ponti canale”. This net is still working correctly nowadays without any problem. Our target was the project of a bridge that, once Canale Cavour had been directed (inside a gallery) below the Sesia river, could permit veloruoters’ passage. On further investigations , some important themes have emerged. Using these new details, we have defined the guidelines useful for planning the bridge into the right context of the site. Connections between facilities and the bed of the river: Sesia river is characterized by frequent flooding , that means that structural elements have to hold out against the impact of debris and the force of water. Connections among facilities: The new bridge has to be integrated among other facilities already existing in the site. It has to interact with them. The protected path: This bridge shouldn’t be only a flat surface to cross the river but it should also provide a protected structure for people. Slow mobility has to compensate fast mobility: All slow mobility users must have the possibility of discovering these beautiful lands to become owners of that broken-up area which is consequence of the high speed market requirements. Dignity of slow mobility facilities: Slow mobility facilities must be studied with the same attention used for planning fast mobility bridge. These themes have leaded us to the project of a parasitic structure which could exploit space between the high speed train bridge and the A4 highway bridge. The result is a suspension bridge lacking in foundation piles which hangs down other two bridges. These choices gave us the possibility to solve all issues related to river’s flood . Besides, we used again a residual space. To face the suspension issue we decided to use a structure based on the principle of the “net-cables”. The final project is a result of several steps. The first one consisted in: experimenting with concept’s maquette, the study of the physics of the spiderwebs, tensegrity and net-cables structures. We concluded that tensegrity structure was what we needed for our architectural issue. As a second step, we studied in a deep way the theoretic discussion about resolution of equilibrium problems of tensegrity structures. We studied also the procedures of form-finding. Through the use of computer devices and systems such as Grasshopper, Kangaroo and Oasys GSA, we made a virtual model of the bridge. Finally, using all programs together , we found the right algorithm to optimize the full project from an architectural and structural point of view. It is possible to see it from the final designing. structural elements with a reduced section (optimization). Suspended Tensegrity Bridge by Stefano Paradiso and Marco Mucedola. Licensed under a Creative Commons Attribuzione – Non commerciale – Condividi allo stesso modo 3.0 Unported License. The powerpoint is embedded here. This page was last edited on 16 January 2019, at 08:43.